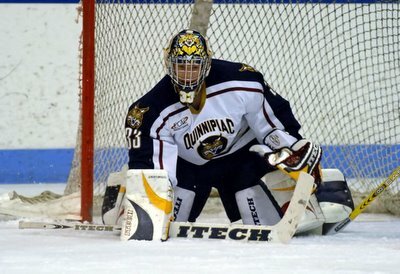 Even though the Quinnipiac Bobcats have cooled off a bit (9-9-0 overall) my nephew Bud Fisher continues to shine. He has been in 14 of the 18 games and sports a great goals against average (.266). His save percentage has slipped below .900 but Bud, as a freshman, is playing very well. I'm proud of you, Bud. Keep up the good work!